Watch full Naruto Shippuden Season 20 Episode 56 English Dubbed full HD online. Naruto Shippuden Episode 469 English Dubbed online for free in HD. Team 7 finishes a mission early in the morning and are dismissed for the rest of the day. Wishing for a higher-rank mission, Naruto suggests finding out Kakashi’s true face. Sakura is initially dismissive of the idea, but changes her mind when Sasuke expresses interest in it. Sakura points out their previous failed attempts at discovering Kakashi’s face. Naruto believes there should be a photo of Kakashi unmasked, though Sakura reveals she already searched it, and only found masked photos. They are approached by a man named Sukea, who having overheard them, tells them Kakashi’s ninja registration photo should show him unmasked. Sukea introduces himself as a photographer interested in getting a big scoop. Sukea joins their mission. That night, the four manage to break into a secret documents’ storage unit, and even find Kakashi’s registration photo, but are apprehended by Anbu before they can look at it. The next day, they are scolded by the Third Hokage, and when talking to Kakashi, Sukea tries blaming the situation on Team 7. Team 7 calls him out on it, and he offers to photograph Kakashi’s face himself while he eats. Team 7 points out they’ve tried that before, and something always interrupts them when Kakashi has a meal. Naruto tries offering Kakashi dango, but Kiba comes by with Akamaru, who jumps on some pigeons. In Sukea’s photos, Kakashi’s face is blocked by a pigeon, Akamaru or leaves. Team 7 is about to give up when they’re approached by Teams 8 and 10. 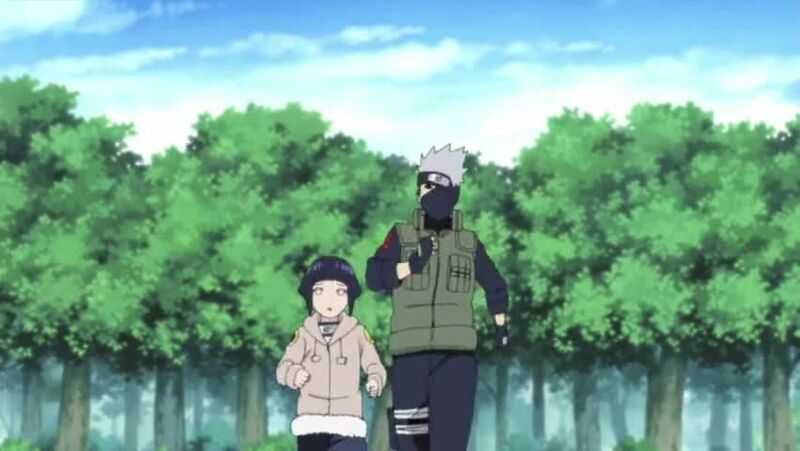 Later, Hinata runs to Kakashi, saying a woman has drowned in the river. She takes him to her, in reality a disguised Naruto drugged by Sakura. They intend to expose Kakashi’s face by having him perform mouth-to-mouth resuscitation, but he decides to take the disguised Naruto to the hospital instead. Hinata reports the plan’s fail. On his way to the hospital, Kakashi is attacked by ChÅji, distracting him and causing him to land on Shino’s kikaichÅ«, leaving him immobilised. Ino tried body switching with Kakashi, but a frog leaps in front of her jutsu as Shino calls back his insects. Shikamaru traps Kakashi with his shadow, and Naruto gets out of his disguise, calling out for Sukea. Shikamaru begins forcing Kakashi to unmask himself, but Team Guy comes around, Neji running away from Lee, who wants to spar with him, followed by Tenten. Neji and Lee kick up some dust running around, while Tenten ends up tripping Shikamaru, breaking his hold on Kakashi. Kakashi vanishes, revealing he was a shadow clone all along. Sukea bids the genin farewell, while Kakashi watches from afar with Team Guy, who are actually transformed shadow clones. When Team 7 moves walk their way, Kakashi and his disguised clones are also released. Sukea grows apprehensive when he walks past Guy, who asks him if there was any trouble, having heard about the earlier commotion with Kakashi and the genin. Guy asks Sukea if they’ve met before, which Sukea denies. Guy leaves, sure he’s met Sukea before. In his apartment, Sukea begins removing his disguise, revealing himself to have been Kakashi all along, and going to shower. Kakashi thinks back to earlier, and concludes his team’s team-work is improving, and that he won’t be able to pull something like this again many more times.